I wanted to let everyone know that there is a Visual Effects Society handbook being written by quite a few visual effects artists, myself included. There's already a publisher involved and the plan is to release it next year. I have a few different articles halfway done for this blog that hopefully I'll be finishing up and posting once I have more writing completed on the handbook. For full details on the handbook and it's release please follow link below. Latest Info: Handbook has been released posting. People have been asking me to provide some of the details of the Cloud Tank so that's been on a long list of subjects. Recently I had to write up some of the notes so thought i'd post it here as well. 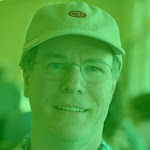 When I start in visual effects I was hired by Doug Trumbull as his assistant. The first day I was asked to create clouds in a liquid for a film that he had just started working on called Watch the Skies. You may remember it by the final film title, Close Encounters. They needed to create clouds and they liked the look of pouring cream in tea or coffee. I was given a 20 gallon aquarium and $20 of petty cash. I worked it out in a few days with additional ideas from Doug, Wayne Smith and others. This same process was later used in a number of films and commercials. (Raiders of the Lost Ark, James and Giant Peach, ID4, etc) Actually most of these used the same exact tank as well. I've attached a couple of primitive drawings to make it clearer. My photos are packed away deep in boxes otherwise I'd post some here. This was also covered to some extent in the Close Encounters book. [Update: 12-22-11 To make things a little clearer I'm adding some notes here. The basics are a large all glass aquarium was filled halfway with salt water and then fresh water was carefully added to the top. 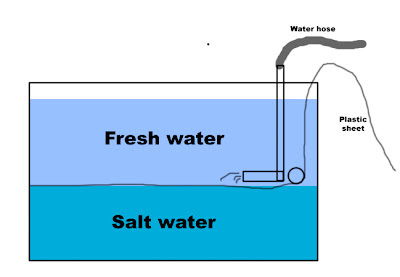 Salt water is heavier so tends to stay on the bottom but you want to avoid mixing them if possible. That's what some of the details below are about. Also best to avoid getting the water too warm. It's very difficult to see any difference in the water once filled since it all looks the same (assuming you've also cleaned the tank and filtered the water). under the right light and angle you may be able to just make out a slight difference. Next white liquid tempra paint is injected in the fresh water portion (top), usually just a few inches from the dividing line of the fresh and salt water. Think of a large syringe with an aquarium tube going into the water. When the tempra paint is injected it billows outward like cumulus clouds and will tend to sink a bit. 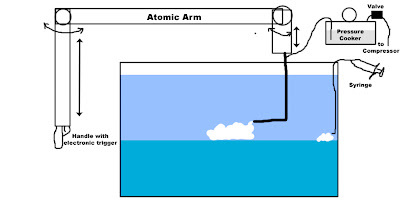 But the salt water prevents it from going lower so the 'cloud' tends to flatten it's base on the salt water line and and billow outward, similar to real clouds based on air pressure levels. Avoid going below into the saltwater since the clouds will just drop to the bottom of tank. Water was purified and filtered in 2 large hot tubs/wine tubs(?) 1000-2000 gallons in size. The salt water was pumped in first usually to halfway mark, dependent on the shot. Sheet of thin plastic (visqueen) was laid on top. Think of the plastic used for heavy duty trash bags or painter's drop cloths, flexible but not easy to tear. This was longer than the tank front to back and would drape out the back of the tank. A PVC pipe running the width of the tank was placed on top of this with a rig. Later to remove the plastic it would be pulled out and this PVC pipe was used to keep it down. A PVC piping system that looked like a fork from above was placed just above the plastic and the fresh water was pumped in. When done this was removed and the thin plastic sheet was removed. Now it appeared as just a tank of water but there were two layers if you looked very carefully. 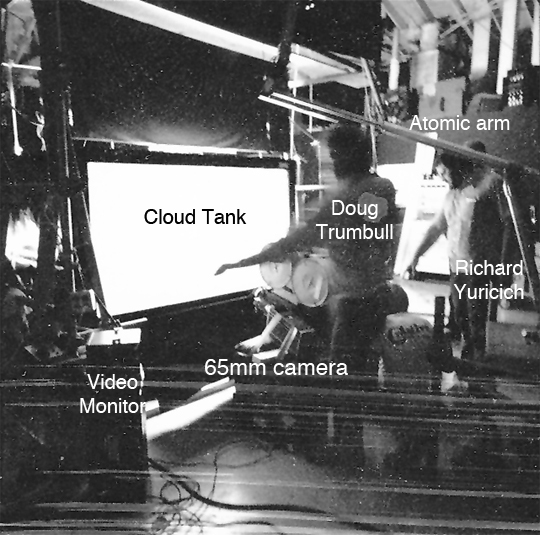 A large syringe was used with aquarium tubing to add small forced perspective clouds in the distance. The mixed white tempera paint was injected right above the slat water layer. if it went below the tank was contaminated and would require a full redo. 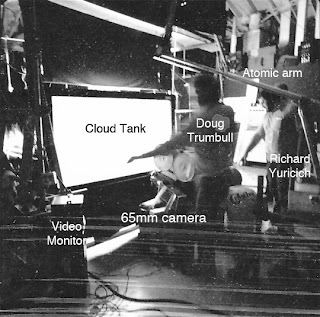 Next an atomic arm was used to inject the main clouds during shooting. This allowed the operator to stand in front of the tank near the camera and as they move it around a brass tube was moving in the tank. An electric trigger on the handle would cause the tempera paint to be injected as the arm was moved. The tube came from a pressure cooker filled with the paint. Pressure was supplied from a compressor and an electronic valve was connected to the atomic arm trigger. We also had a light source (with rotating colored lights) that went down this same tube as a fiber optic. Frame rates could be under cranked or over cranked depending on the look. When I started this blog I had posted news on a young man who was killed by a drunk driver. Ryan Dallas Cook was in the band Suburban Legends, which my daughter saw quite a bit. The drunk driver worked for Hyunda of Korea and the local company helped him to escape back to Korea. He has finally been tracked down and extradited back the the U.S. for trial.